Ever since I saw the three-ingredient chocolate tart filling at Cooking on the Ranch three months ago, I've wanted to make it. Lea Ann got the recipe from Mark Kalix, the chef teaching a cooking class at her local Sur la Table. The recipe says it makes an 8-inch tart, but I don't have a tart tin that size. So I increased the amounts of the three ingredients to bring up the volume to fill my 9-inch tart tin. I resisted the urge to add other ingredients (not easy for me!). If Lea Ann says it's wonderful, I believe it! And next time I might make my usual addition to anything chocolate: a little espresso powder, triple-strength brewed coffee or Kahlua. But it is by no means necessary. 1 Add flour, powdered sugar and salt to work bowl of food processor; turn on for about 3 or 4 seconds to combine. Add chunks of butter; pulse to a crumb texture. Add egg yolk and liquid; pulse until the dough starts clumping together. This is to be a crisp, more cookie-like crust, rather than a flaky pastry; so there's not quite the concern about over-processing. Flatten slightly into a 4- to 6-inch round disc, wrap and refrigerate for 30 to 60 minutes. 3 Cover chilled pastry with reserved piece of foil, clean side up, pressing it to fit well. Spread 2 cups of ceramic pie weights (that's two packages of Mrs. Anderson's ceramic pie weights) over the foil. Bake for 15 minutes. Remove foil and weights; continue baking for 10 minutes, until lightly browned to a pale golden. Let stand to cool a bit. 4 While pastry is cooling, make the filling. In 2-quart saucepan over medium-low heat, heat the cream until small bubbles begin to form around the edge. Remove from heat; add chocolate chips and stir until thoroughly smooth. In small bowl, beat the eggs and egg white; stir beaten eggs into chocolate mixture until thoroughly blended. 5 Turn oven temperature down to 325F/165C/Gas3. Pour filling into prebaked pastry shell. Bake (with tart tin on baking sheet) for 25 to 30 minutes, until just set. Do not overbake. Cool to room temperature, about 1 hour. Remove from tin. Serve at room temperature or chilled. I have some friends coming over for dinner next weekend and had wondered what I was going to make for dessert. But I think I just found it! Doesn't look to complicated either. Drunken Noodles with a fine Cabernet wine for the main course. Chocolate tart and port for dessert. Perfect! Sounds like a grand meal, Richard! And a little espresso powder or a couple tablespoons of very strong brewed coffee or Kahlua would not go amiss in the tart! Amy, thanks! It has a wonderful texture. I hope you'll make it soon! Espresso – yes, yes! Or Kahlua. Or triple-megaton coffee. Or all of the above. Coffee makes the chocolate! Gotta do something about the color, though. Ingredient #4: whipped cream bumping against the ceiling. Ingredient #5: maraschino cherries – eight or nine. Nothing over the top. Soooo true, Sully! Garnishes needed. Buuuut I barely got this made this morning in time to post it today. Had no garnishes on hand, AND my best photo shoot area was still unavailable because my painter hasn't taken away all his equipment yet. So it's really a wonder I was able to stick to my posting schedule (though several hours behind my usual). I *could* have whipped some cream, got out a piping bag, etc, etc. But I'm exhausted! Mmm. This sounds delicious, and easy! Definitely marking this one down for the future. Thanks! Thanks, Lorrie! I think you'll like the texture of it, too. This looks incredibly rich and inviting with that chocolate filling! Oh my, my, my... hmmm, maybe some orange essence. Guess what the kidling and I will be making during next week's cooking session. This looks amazing! Thanks, Debby! I think anyone who likes chocolate would like it! Angie, I really like the texture of it. And my shortcrust pastry works very well with gluten-free flours/starches. This sounds wonderful, Jean, and I'd make the crust too. I actually enjoy making a crust. I'd have a hard time resisting chopped hazelnuts as an addition to the tart, though. Oh, Jacqueline, I agree. Isn't chocolate and orange a magical combination! Have fun with the kidling! Judy, don't resist adding chopped hazelnuts! That would be wonderful! I'm so glad that you gave this a try, and thanks so much for that shout-out. I love this chocolate tart. And also glad that I now have a recipe if I want to increase for a larger sized tin. I make a chocolate and orange brownie and have been wanting to make this again and play with flavors. Happy Friday Jean. And hugs to you. For me as well, Margaret. This is very rich! Jean. I am salivating at 10 am. Must. make. this. tart. As for today, I am finally getting around to making your Magical Meyer Lemon Bars. Not your typical snow day fare perhaps, but I want something sweet and sunny and special today, and I picked up a bag of Meyer lemons when I was doing my grocery run yesterday. Cheryl, thank you so much! Be sure to let me know how they turn out for you. Have a wonderful and cozy snow day! Thanks, Greg! It's fun making something so uncomplicated! My dear Jean, thank you so much for sharing your wonderful and tasty recipes with Roses of Inspiration. I always enjoy having you at the party. Enjoy the weekend, sweet lady! Hugs! Sweet Stephanie, thank you so much! I hope you and your son will whip one of these up soon. Along with a cup of coffee (decaf for me, please). I will have a go at this Jean. It sounds like something I could do. I have been trying my hand at making bread just lately.I have been using a recipe and method from the BBC cookery site. It has been working for me. For Christmas, Abigail, my youngest bought me a posh baking book called, The French Baker , who is Jean Michel Raynaud. Tony, thanks! It's good chilled as well, but I love the texture of this at room temperature. Glad you're having success with your bread as well. I love making bread. Kneading dough is very therapeutic! But if you go to my Recipes index page, under the Bread subheading, you'll find my recipes for no-knead breads as well. I write recipes very carefully so that no one has to "put the lot in the bin!" The tart looks wonderful, Jean. Simple and delicious. Nice to find a simple recipe for something chocolate instead of the usual cake. Thanks for sharing and enjoy your weekend. Thanks, Sandi! Most days I prefer pies and tarts over cake. Most days! David, thank you! Let me know how it turns out for you! Thank *you*, Chris! I put a couple pieces in the freezer. Can't wait to see if it freezes well or if I wasted them! Sweet Jean, just dropping in to let you know that this beautiful post will be featured at Roses of Inspiration tomorrow. Hugs and joy! Stephanie, thank you so much! And I will tweet a link to your post. I want all my tweeps (especially the ones who like tea and pretty things! )to know your lovely blog. That is a killer Chocolate tart, Jean I need a slice, It is so delicious, thanks for sharing with Hearth and soul blog hop, tempting . 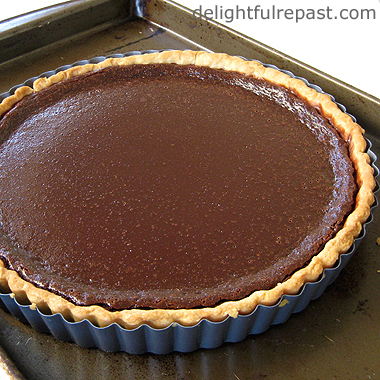 Jean, your Chocolate Tart looks amazing and the recipes sounds luscious! I love that the filling only as 3 ingredients! Pinning and will share. Thank you so much for being a part of our Hearth and Soul Hop. Oh my goodness Jean, three ingredients make this fabulous looking tart??!! I must make it soon, and I appreciate you tweaking the recipe for a nine inch tart tin. I will try your crust, also, as it sounds so good! Happy baking day to you, my friend! April, thanks so much! Yes, I was amazed at the three ingredients! Thanks, Kitty. And I liked that my tweak used up the egg white that was left over from the crust -- I hate to waste! This looks fabulous! It reminds me of a dessert a chef friend of my sisters made and would share with our family. Thank you, Sarah. I do hope you'll try it soon and let me know how you liked it! Thank you, JES! Glad to "meet" you! Looking forward to checking out your blog. Thanks, Tania! Wish I had a slice right now! I love chocolate so much, I'm truly fond of chocolate in every form you may offer it to me, my sweetest Jean ! Think, just yesterday morning I've published a post about the importance of hot chocolate during the XVIIIth century ( with recipes ), we've been inspired by the same topic, isn't amazing ?!? Thank you, Dany! I think you're right about winter and chocolate -- I'm really not a huge chocolate fan, but lately I've been really enjoying it. I wondered why, and I think you've hit on the reason! Oh my gosh, my tummy is growling! Seriously. Help me! Get me to some chocolate before I burst! Heather, thank you! I like it with just a bit of unsweetened whipped cream. Thank you, Lindsay! But you *can* make this, I'm sure of it! JES, thank you! Looking forward to joining you again! This looks so decadent! Thanks for sharing on the Creative K Kids Linky Party this week. I hope you will join us again next week. 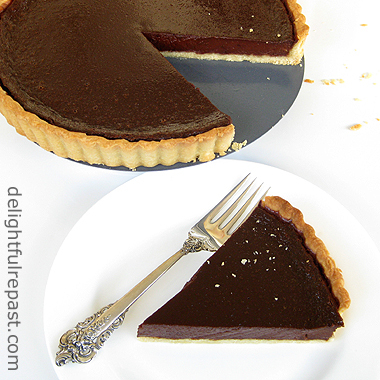 Oh my goodness...this chocolate tart looks absolutely gorgeous and oh so scrumptious, Jean! Thanks, Kelly-Anne! My tart crust goes perfectly with that super easy filling. What's not to love about something rich and chocolaty AND easy! Looks great Jean!! And easy too! My kind of recipe. Thanks for linking up at the Country Fair Blog Party!